Today is the Birthday of Saint Camillus, founder of the Camillians, Servants of the Sick. This year has been a celebration also of their fourth centenary, to end on July 14, 2014. 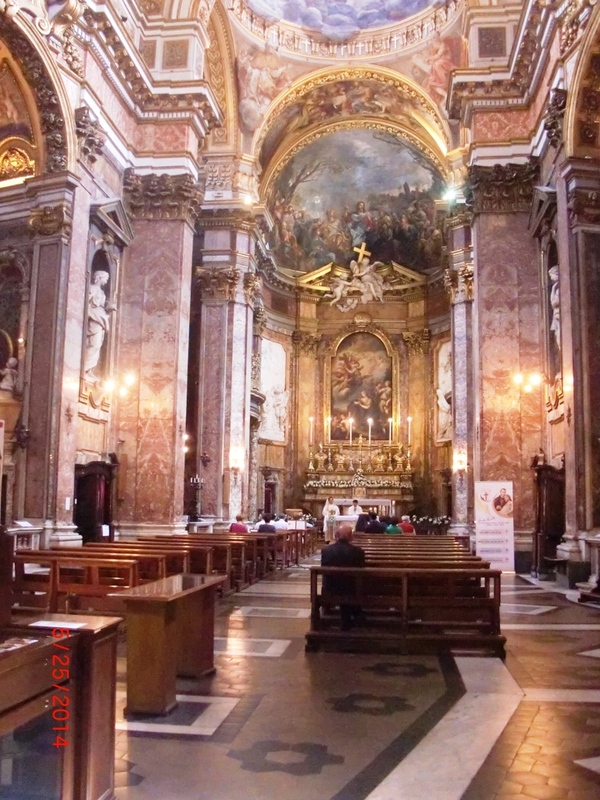 It was natural for us to worship at La Maddalena, the order’s home church in Rome, for Mass, but we had other reasons to visit the golden baroque church one block from the Pantheon. We arrived early and absorbed the beautiful space of gilt and marble. La Maddalena is not a large church (compared to some basilicas in Rome), so the color and glimmer and proportions lift the spirit intimately, as intense beauty often does. I turned to gaze up at the baroque organ loft behind us, gilded and dancing over the front door with its saints and angels. Higher above was the Camillian red cross, the same as the one emblazoned on the brothers’ black cassocks. It is the red cross that was eventually adopted by the Red Cross organization, one seen worn by those Camillians caring for the wounded on the battlefields of the last century. It is good to be reminded that we are merely custodians, caretakers, given bodies and minds for a time on this earth. Our work is his work. To be sure, we are of immense value, unique creations, and if we say yes to God, allow him to work within us, he will work his will through us. We need not worry too much, as San Camillo did, about succeeding in every task. We say our prayers, are obedient to his commands, and we let him do his work in us, through us. We plant seeds, not knowing if they will be reaped or even who will reap them, for we may not be doing the reaping. I have found that when I stand aside, getting out of the way, waiting and wondering what God has in store for me (never knowing for sure), I see miracles happen. This is the thrilling joy of being a Christian. This is why, as St. Paul says (and Sister Emanuela too for that matter) we cannot be tepid in our faith. For we are part of a great drama, the salvation of the world. We are players, not directors. So we arrived and took seats in the polished wooden pews and knelt and prayed and watched and waited. I lit a candle before the Madonna of Health in the south aisle, a charming image said to have worked miracles. I inhaled the flowers filling the chancel. I watched others step in quietly and and take their seats. I wondered what God would show me this day, the Birthday of San Camillo. The procession formed off the sacristy in the north aisle and about twenty Camillian brothers robed in white processed down the north aisle and up the central aisle. They took their places and the Mass began. While in Italian, the liturgy was familiar, and I felt a part of it in spite of not knowing the language. 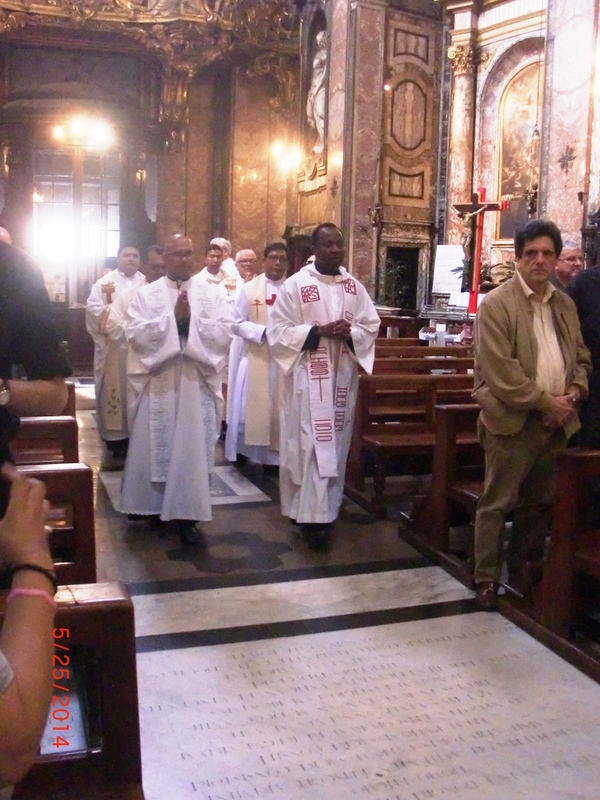 The service ended with singing before the relics of San Camillo in the south aisle. After many arranged photos of the fathers and brothers with the Camillian lay family who had come on pilgrimage, we greeted Father Paolo and chatted a bit. Father Alberto, the Secretary General for the Camillians, took photos (thank you, Father). Then I met an Irish priest who asked if I would tell his group about my novel set in this church. I was stunned to be asked to say anything in this church of St. Mary Magdalene, where such beauty often leaves me speechless, and I’m still not sure it was real. But I did speak, I think, and from the podium’s mike I mumbled and stumbled, trying to summarize the key points of the novel: Mary Magdalene and the first century Christians, the Apostles Creed and the triangle churches in Rome, the clues and the quest of my heroine, Kelly, the love story, the suspense story, the desire to correct Dan Brown, and a consideration of how scholars approach New Testament history, showing the preponderance of evidence for the Resurrection. 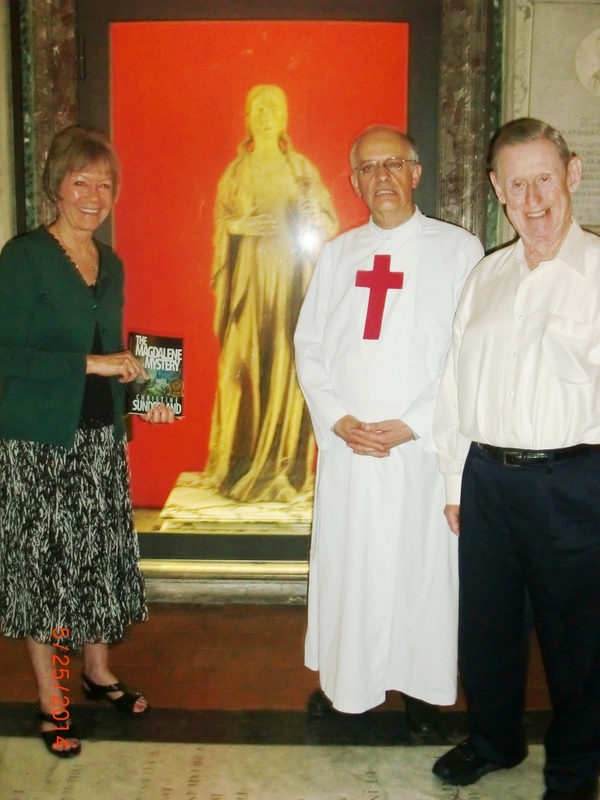 Christine with Father Paolo and Harry, the Medieval Magdalene in the background. I wasn’t expecting such a welcome and interest from these lovely people from Australia, the Philippines, England, and northern Italy. The copies of The Magdalene Mystery I brought for Father Paolo soon found their way into the hands of these faithful folk and it is with great thanksgiving that I know they will circulate in these countries. We continued our lively chat in the adjoining house over a buffet lunch. 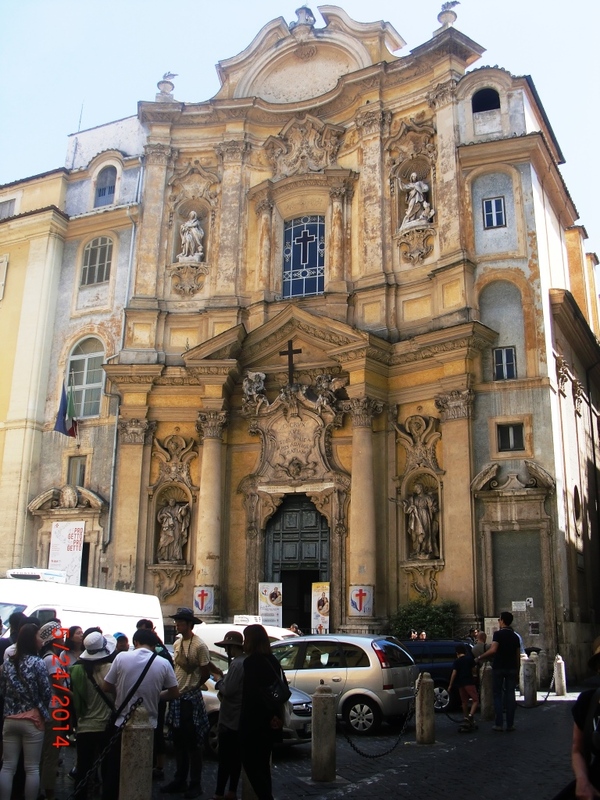 Mary Magdalene smiled, the angels fluttered about us, and San Camillo was gratified for his Camillian children from around the world, that they had a home in Rome like La Maddalena, his own church. I think I absorbed some of Father Paolo’s joyful energy. It radiates to all who work with him. Christianity is contagious, as they say, for it’s true. Thank you, Father Paolo and the Camillian brothers and lay family for your warm welcome. Thank you for your good work in Rome and, through these caring brothers and sisters, in the world. You are a true son of San Camillo.